Last month we reported that Neil Gaiman the famed Brit author of short fiction, novels, comic books, graphic novels, whose works include the comic book series The Sandman and novels Stardust, American Gods, Coraline, and The Graveyard Book will be writing a new Dr. Who episode that will appear in the second half of Season 7. Well further Whovian info has come forward via the the French website Reviewer.fr that the Gaiman episode will be based around….. The Cybermen! The Cybermen’s first attempt at invading Earth, around 1970, was chronicled in The Invasion and the last real Cybermen episode to speak of was when they appear, briefly, in the episode “A Good Man Goes to War” (2011), no longer bearing the Cybus ‘C’ logos on their chests. 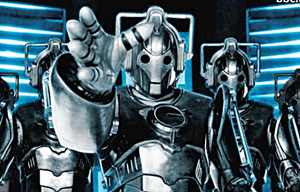 Stated as belonging to the Twelfth Cyber Legion, they are led by a Cyberman of the same design as the Cyberlord in “The Next Doctor”. The Doctor’s companion Rory confronts them about the location of a secret asteroid base, because they monitor that entire quadrant of space. Pretty awesome news and it just goes to show that you can’t keep a good Cyberman down. A List: Dallas & GOProud Member Taylor Garrett Claims 2nd HomoCon Hate Crime. Or Is It Just A Con?